The No. 3 Mobil 1/Sirius XM Corvette C7.R had a podium finish, coming in second place, just 1 second behind the leader of GTLM. 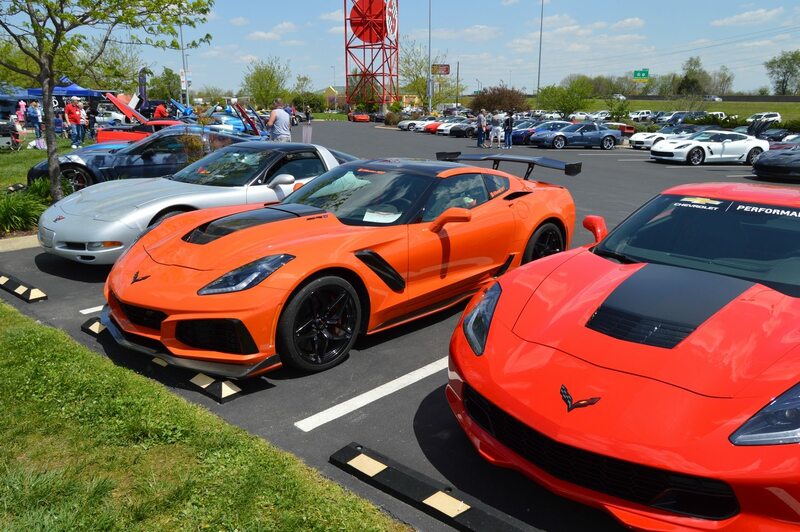 Over the past eighteen years, Corvette racing has established itself as a world contender in auto sports racing, taking multiple team, driver and manufacturer wins during that time. As the 2017 IMSA GT Le Mans season comes to a close, the No. 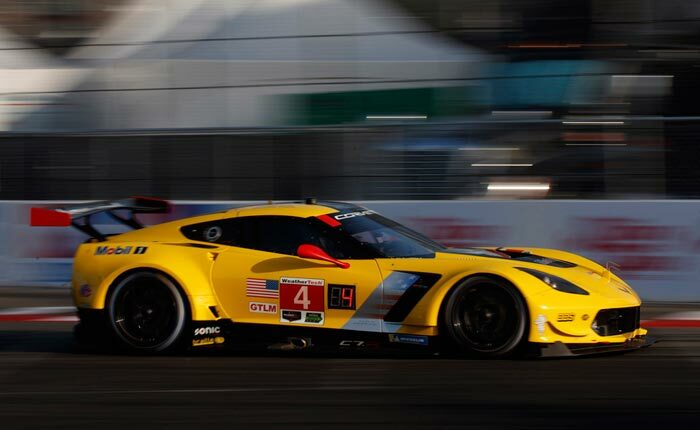 3 Corvette C7.R racing team adds another championship-winning season to its already incredible list of accolades. 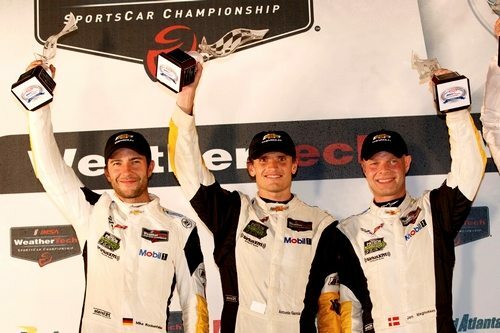 Driver’s Jan Magnussen and Antonio Garcia secured the GT Le Mans (GTLM) Driver title in the IMSA WeatherTech SportsCar Championship after completing the open stages of the 10-hour Petit Le Mans endurance race at Road Atlanta. By starting the final race of the season at Road Atlanta also meant that the No. 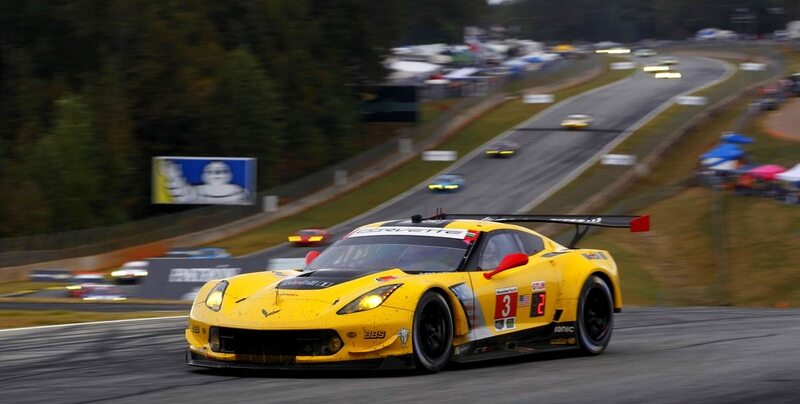 3 Mobil 1/Sirius XM Chevrolet Corvette C7.R squad had also earned the GTLM Team Championship. Mike Rockenfeller, Antonio Garcia and Jan Magnussen celebrate a second-place finish at the 2017 Petit Le Mans. Garcia and Magnussen also celebrated winning the 2017 driver, team and manufacturer championships! (Richard Prince/Chevrolet photo). Magnussen and Garcia had already claimed three class victories during the 2017 season prior to entering the Petit Le Mans race on October 7, 2017. Previously, the pair had won the Mobil 1 Twelve Hours of Sebring as well as the GTLM rounds at the Circuit of the Americans and at Virginia International Raceway. The team also had a podium finish at Watkins Glen, where they finished in third place. “This championship was absolutely a team effort. The drivers, crew members and engineers were versatile and adaptable, and everybody on the No. 3 Corvette C7.R team contributed throughout the season. Jan and Antonio were consistent, smart behind the wheel and took advantage of Mike Rockenfeller opportunities when it mattered most. This was a hard-earned championship.” Mark Reuss, Executive Vice President, Global Product Development, Purchasing and Supply Chain. The No. 4 Corvette C7.R at the 2017 running of the Petit Le Mans at Road Atlanta (Richard Prince/Chevrolet photo). 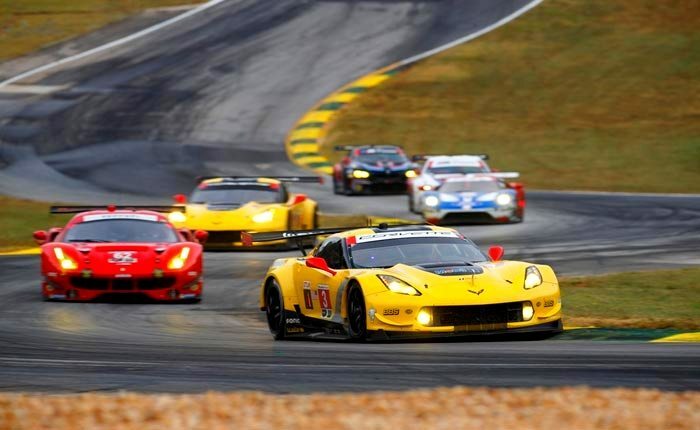 Since Corvette Racing’ inception in 1999, the team has now earned a total of 11 Driver titles and 12 Team Championships in North American professional sports car racing, with their first championship dating back to 2001. This 2017 Championship also marks the second consecutive year that Corvette Racing has earned this distinction as Oliver Gavin and Tommy Milner, drivers of the No. 4 Corvette C7.R were the 2016 champions of this same series. 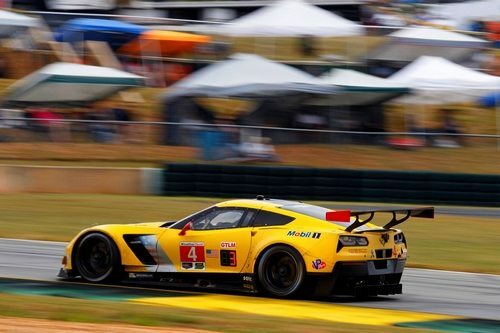 As for both teams performances at the Petit Le Mans at Road Atlanta, drivers Jan Magnussen and Antonio Garcia were joined by Mike Rockenfeller in the No. 3 C7.R Corvette and drivers Oliver Gavin and Tommy Milner were joined by Marcel Fässler for the 10 hour event. The pair of Corvettes qualified third and sixth place respectively as the teams prepared for the start of the race. Throughout the day, a total of six different cars led in GTLM over the 392 laps (just short of 1,000 miles) run. The No. 3 Corvette led the race four tires, due in part to the excellent pit work and race strategy. A late pit stop for fuel and tires was pivotal to the team’s success. Garcia brought the No. 3 into the pits running in third place, but gain a position due to the quick stop, leaving the pits in second place. This decisive pitstop solidified Chevrolet’s hold on the Manufacturers Championship with just 50 minutes left in the race. Despite a valiant effort by the entire team, the No. 3 Corvette could not outrun the winning BMW, and ended up finishing the race in second place just one second behind the leader. The No. 3 leading GTLM early on during the race. Ultimately, the No. 3 C7.R Corvette would finish in second place. Milner, on the other hand, driving the No. 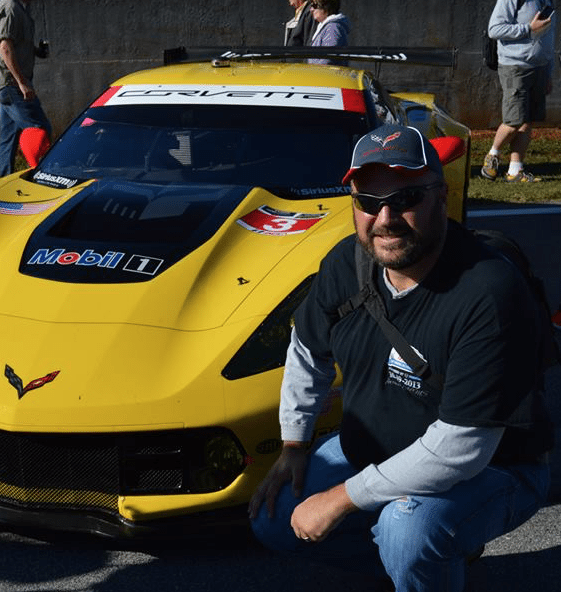 4 Corvette in the final leg of the race, managed a fourth place finish in GTLM. While one spot shy of a podium finish, the team managed to maintain good position throughout the race, which was especially tricky given the wet conditions on the track at the start of the race. As with the No. 3 team, the No. 4 attributed much of its success to creative driving stragegy and more stellar pit work. The 2018 IMSA WeatherTech SportsCar Championship opens with the Rolex 24 At Daytona on Jan. 27-28, 2018. Gavin Earns 50th Career Win at Long Beach!